This week we had a home football match to play and I had tennis to play immediately afterwards. During the week I ate well and alkalised my body. I bought three OTE carbohydrate bars ready for Saturday. In the match I played centre back. There was less running in this position but more tackling and fast sprints. There were two forwards with speed, so the game had pace. At half time I sipped my electrolyte drink. I felt good during the match and no calf tightness. After the match I drank my recovery drink and ate 1.75 carbohydrate bars. I did not feel as hungry compared to previous week. I went straight to tennis and played one set. My partner and I won, with the end score being 7-5. It was a hot day and I could feel fatigue in my body. I started to cramp in my toes and calf. I realised I had not drank enough electrolyte. At change of ends on the court I drank electrolyte. It took a little while to work, but my cramp did recede, and after the tennis I did not suffer further cramping. I got home and realised I left my compression leggings at work. I was disappointed as I always look forward to wearing them to help my recovery. I decided to have a hot shower and then have a 10min cold water bath. I like the cold water baths. After the initial shock of the cold, my legs feel good in the cold water. When I get out of the bath I feel like my legs are fresher and a little numb, I like it. For the rest of day we were at a BBQ and playing with my children. My legs felt good. I am not able to play football this coming weekend. My plan is to continue alkalising, buy a thermometer to test the temperature of the bath and drink alkalising salts (have not done so on a regular basis yet). I must remember to prepare my compression clothing for recovery. In fact, I could get into a routine of checking I have everything in place for recovery pre match. I also want to start ice baths. Once I test the temperature of the water I can adjust it with the ice. Last week I avoided mid week training, as my legs needed more recovery time. This week I can feel my legs will need training, but towards the end of the week. Getting the balance between rest and flexibility, and training will be important. I have a weekend of no football. Next game in two weeks. This week was a different intensity of sport. I ran a 30 min fitness session, which was followed by drills and then 6 aside game. I went straight to tennis and had easy set of doubles and played single games for about 30minutes. I ate two additional OTE carbohydrate bars immediately after football and just before tennis. I did not feel so hungry or tired. The football training was not as taxing this week, so this may have made a difference. I drank Electrolyte during tennis and wore compression garments throughout all sport. This week I read more on ice baths. The suggested time in the bath is 10 mins at 10-15 degrees. It has been raised that a cold bath may be just as effective. This week I had a 10 min cold bath after sport. It was freezing getting in but after 3minutes my body adapted to the temperature and it felt nice. I could imagine putting ice in to keep it a little colder. My feet got slightly tingly towards the end of the bath. I actually over stayed in the bath by another 4-5 minutes. When I got out of the bath my legs felt cold, light and semi refreshed. I put my 2XU recovery leggings on until 11am the following morning. My legs felt slightly tired and tight because I played more tennis than normal. But, they did not feel heavy and cumbersome. It was a good test doing the cold bath. I will try ice in the bath next time. I need to buy a thermometer to test the water temperature. Our first game of the season is next weekend. In the team there are two injuries. A player strained his calf during training and another has low back pain after 45 minutes of football. I am treating them both and deciding how best to advise them on recovery. Ice baths maybe a good start after the match. A fortnight ago I was looking forward to playing football after alkalising my body during the week. It maybe placebo, but I felt less tension in my body drinking alkalised water (pH drops and Greens powder) during the week. The tension in my Achilles was less. My thigh muscles felt lighter with less tiredness during the day. We did fitness training and had a 60 min squad game. I had more desire to run faster with the new feeling in my legs. I could play faster in the game and recover quicker. I did tire after 45minutes, but I put that down to fitness. I continued my nutrition regime of Nuun electrolyte drink, SIS recovery shake, and OTE carbohydrate bar. I also wore my 2XU MCS compression leggings during training and 2XU recovery leggings for 24 hours after training. Post football training I went directly to tennis and played for 1 hour. I did feel slight fatigue during the tennis. I may need to increase my carbohydrates intake between football and tennis, and during tennis. I plan to have a bite of carbohydrate bar every 20 minutes, after 60 mins of training. I also must continue to drink electrolyte drink during tennis. I realise my fitness levels are not match level yet. This may be the main reason for my fatigue levels during tennis. Listening to my body, I think there was an element of both fitness and nutrition. I will continue to play with my nutrition to optimise my performance. On element of recovery I have yet to implement is the Ice Bath. I will read into this more and test Ice Baths in the near future. In my gym training I am not doing leg strengthening. I don’t want to slow my running speed down with heavy big muscles (very different to cycle training). Once I feel my leg speed is better, I will introduce a measured amount of leg strength in my gym training. I have been reading a book called Thrive by Brendan Brazier. He is an Ironman athlete who alkalises his body and is a Vegan. He talks about Cortisol and what the foods we eat can do to our bodies. His performance vastly improved by alkalising his body. He has great shakes, energy bars and meals in his book. He has also produced recipe books. I plan to follow the principles of Thrive and assess what I am eating after sport and between sporting events. Eating the best foods most of the time will add to my goal of consistently performing at my best. This weekend I was away and could not attend normal football training. Instead, I did some fitness training with another player (manager) in the team. We decided to do 15 minutes of interval training. I wore my 2XU MCS compression leggings and drank alkalised water with a Nuun (electrolyte) tablet in it. I do not recommend mixing a Nuun tablet in with Alkalised water. It tasted terrible. I would separate the two drinks in the future. This was the first time I had performed 10meter sprints interspersed with jogging. The more I did, the better my legs felt. I could lift my knees and quickly plant them down for quick acceleration. I felt I could go faster and my legs felt light. Sprinting does not replicate how a player moves in football training. I want to assess football drills and fitness, and change my interval training to make them more sport specific. I feel some research on the web is needed. The Manager has asked me to run the fitness element of training. I look forward to sharing some new football specific fitness drills and some of the information on nutrition. If the whole team benefits from better nutrition, the entire teams performance will improve. As I look more into recovery I am more aware of what newspapers, magazines and the web are showing in elite sport. I have read about ice baths being used by Mo Farah, Paula Radcliffe, Professional Football Teams and Professional Cycling teams. I have not read the research thoroughly yet, but empirically, there appears to be evidence ice baths help recovery with specific athletes. In a previous blog I noted that a Professional Cycling Team in the Tour De France used ice baths at a temperature of 10-12 degrees celsius. Today I have noted ice baths mentioned twice more in the media. The first was Andy Murray talking about age and recovery after his first round match in the US Open this year…. 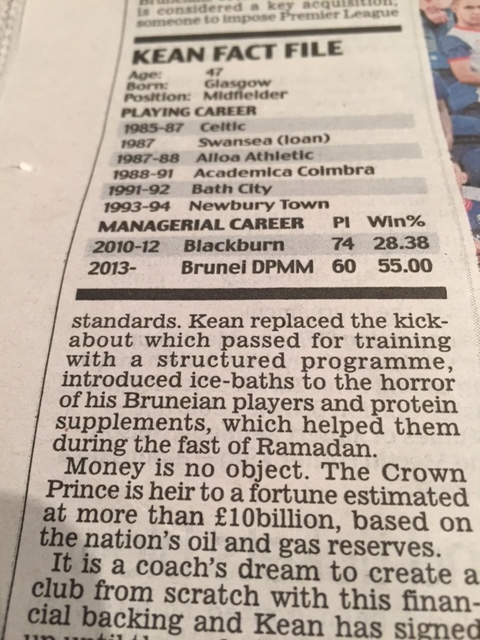 In the Daily Mail there was an article about a new football team owned by the Crown Prince of Brunei. He has employed Steve Kean, former manager of Blackburn Football Club. The first two changes he has made at the club are the introduction of ice baths and protein supplements (see attached image). The question I ask is..why do ice baths continue to appear in the press, as a recovery strategy for elite athletes across a range of sports. It is an assumption, that not all athletes like ice baths, but for those that do like it, it forms an important component of their recovery strategy. Recovery is the 4th discipline in Triathlon, and it is the secret to building muscle mass. Knowledge about Recovery is growing in amateur sport. There is readily available information in Endurance Sport magazines and websites. I am changing my Sport participation from Ironman training to playing Football, Tennis and Cycling all in a weekend. These sports are explosive, and power based, rather than pure endurance training. I know my body will go through a period of readjustment to these sports. Avoiding injury will be important. My goal is to use my knowledge and experience of recovery to enable me to compete in three sports over one weekend, on a regular basis. I want to have enough energy to play each sport, but also get stronger and prevent injury. Recovery is a key to this plan. I want to recover faster, be stronger and perform at my best. I want to avoid cramp and muscle injuries. My interest in Recovery has started with Compression clothing. I used these in Ironman training and found them very beneficial. I wore them overnight and when I woke up in the morning my legs felt “fresher” and less painful. I did an online search of compression clothing. There is a large range of brands to consider. I decided to look at the original compression garment Skins and, a brand I used in Ironman, 2XU. Website reviews of compression garments showed these two brands rated highly. The 2XU brand of compression leggings had been researched by the Australian Institute of Sport. I decided to test 2XU. 2XU had several models to choose from; performance (MCS), recovery and hybrid models. Each model differed by the compression quality of the material each used. The performance leggings were designed to reduce muscle vibration and damage. I decided to test the performance and recovery leggings. Other important electrolytes are Potassium, Calcium and Magnesium. When we sweat we lose these electrolytes in our body. Sweat cools our body down. When we lose Sodium we retain less water and lose our feeling of thirst. Hence, dehydration is a serious problem. Drinking water is not enough. When we sweat we lose these electrolytes in our body. Sweat cools our body down. When we lose Sodium we retain less water and lose our feeling of thirst. Hence, dehydration is a serious problem. Drinking water is not enough. It appears that some electrolyte products do not contain enough Sodium. Coconut water is currently trending as a natural electrolyte replacement. However, It appears commercially sold coconut water is too low in Sodium to be used as an electrolyte replacement drink. I searched online for the best electrolyte replacement drink for my needs. I came across Nuun (pronounced Noon). Nuun has excellent concentrations of Sodium, K, Mg, and Ca. It also contained Sodium Bicarbonate. Sodium Bicarbonate can, apparently, neutralise some of the effects of Lactic acid. It is low calorie and contains only electrolytes (allowing me to choose my own source of carbohydrate). There are no artificial additives and has natural flavouring. Another electrolyte product I discovered in my local bike shop (Wild Bikes) was OTE (original owners of SIS nutritional products). OTE also has no artificial flavours and is low in calories, but does not have the Sodium Bicarbonate content, when compared to Nuun. Interms of recovery drink I have used SIS recovery drink in the past. Current versions have 50% more protein, carbohydrates and electrolytes. I compared this product to Sun Warrior protein powder (Vegan). Sun Warrior has significant amounts of protein and very small amounts of carbohydrates. I can see this as a great source of protein I could use after gym training, but not a recovery drink. I can see SIS repid recovery drink does not have enough protein. I will therefore look to supplement this drink with a carbohydrate bar/ shot and eat wholefoods at a later date. The bath temperature used by cyclists was 10-12 degrees. They could sit comfortably in them and even fell asleep. Other benefits listed included pain relief, improved lymphatic drainage and cooling of the body. Andy Murray (professional tennis player) described his routine after his Wimbledon matches. He rehydrated, ate whole foods, got a massage and then had an ice bath. The other elements of recovery would be active recovery (cooling down with exercise), and stretching. I do light general stretches post match and do more serious stretching 2-3 days after performance. Ballistic stretches before a match is best. I cool down with gradual reduction in activity in the sport I am playing. I could do a light run or cycle. Many of us like to set goals which will push us to our limits. If we want to learn something well, we usually have a teacher or a coach, and this applies to physical training as well. If you set a goal and along the way you get injured, or you can see that your sport is unsafe because your body cannot cope with the loads exerted on it, then have the common sense to change. The ability to listen to your body can prevent acute and long -term injuries. It is not worth training for weeks or months, to get injured and see your goals slip away. A physiotherapist and trainer can help you make common sense decisions about your training goals. Both clinicians will listen to what you want to achieve, and assess your body, to decide whether or not your goals are realistic. Choosing the appropriate training goals will make training safe and achievable. The body is not a machine, it responds to physical stimulus and will adapt over time. Setting goals which are small, on which you can build towards a much bigger goal, is the best way to train. A physiotherapist has knowledge in the areas of pathology, physiology and neurophysiology. A trainer knows how to train to achieve physical goals. Working with a Physiotherapist and Trainer gives you the professional support to choose the training program to best suit your needs. Make a common sense decision now, before you waste time and money, and suffer injuries. Consult your physiotherapist and trainer as they work with you as you achieve your training goals.